Regardless of the labware your assay requires it is important to maximize the usable space of your deck. The challenge is to optimize every square centimeter while addressing restrictions like common range of the pipetting arm and installed automation devices. Another tactic that helps with optimization of space are carriers that can handle multiple tube sizes. This not only allows you to pack the deck but also simplifies the variety of carriers needed for your assays. 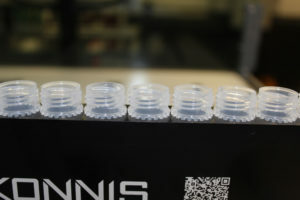 A recent challenge brought to us was fitting sixteen (16) 5ml or 15ml tubes into a single grid strip rack for the Tecan EVO deck. 16 positions was important since with an 8 tip pipette arm multiples of 8 are the easiest and most efficient way to program. The only available option was a 12 positions rack and therefore required more grids to hold the 192 tubes required by the assay (1 grid per strip rack, a difference of 4 additional girds) to hold the same number of tubes on the deck. In addition, the 5ml tube was a specific design that had a protruding ridge just below the threads. Making the most of the space of your liquid handling instrument is crucial to the optimization and throughput of your assay. Contact us to discuss your assay and let us design density into your deck layout!